Allergies, Asthma, Bradycardia, Motion sickness, Parkinson's disease, etc. 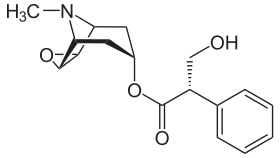 Most muscarinic receptor antagonists are synthetic chemicals; however, the two most commonly used anticholinergics, scopolamine and atropine, are belladonna alkaloids, and are naturally extracted. Muscarinic antagonist effects and muscarinic agonist effects counterbalance each other for homeostasis. Certain substances are known as long-acting muscarinic receptor antagonists (LAMAs). Scopolamine and atropine have similar effects on the peripheral nervous system. However, scopolamine has greater effects on the central nervous system (CNS) than atropine due to its ability to cross the blood–brain barrier. At higher-than-therapeutic doses, atropine and scopolamine cause CNS depression characterized by amnesia, fatigue, and reduction in rapid eye movement sleep. Scopolamine (Hyoscine) has anti-emetic activity and is, therefore, used to treat motion sickness. Antimuscarinics are also used as anti-parkinsonian drugs. In parkinsonism, there is imbalance between levels of acetylcholine and dopamine in the brain, involving both increased levels of acetylcholine and degeneration of dopaminergic pathways (nigrostriatal pathway). Thus, in parkinsonism there is decreased level of dopaminergic activity. One method of balancing the neurotransmitters is through blocking central cholinergic activity using muscarinic receptor antagonists. In addition to increased activity to dopaminergic neurons from anticholinergics, antagonists of the muscarinic-acetylcholine receptors produce a sense of happiness and euphoria. This led to the discovery of various tricyclic antidepressants. Atropine acts on the M2 receptors of the heart and antagonizes the activity of acetylcholine. It causes tachycardia by blocking vagal effects on the sinoatrial node. Acetylcholine hyperpolarizes the sinoatrial node, which is overcome by MRA and thus increases the heart rate. If atropine is given by intramuscular or subcutaneous injection, it causes initial bradycardia. This is because by i.m/s.c it acts on presynaptic M1 receptors (autoreceptors). Intake of acetylcholine in axoplasm is prevented and the presynaptic nerve releases more acetylcholine into the synapse that initially causes bradycardia. In the atrioventricular node, the resting potential is abbreviated, which facilitates conduction. This is seen as a shortened PR-interval on an electrocardiogram. It has an opposite effect on blood pressure. Tachycardia and stimulation of the vasomotor center causes an increase in blood pressure. But, due to feed back regulation of the vasomotor center, there is fall in blood pressure due to vasodilation. Important muscarinic antagonists include atropine, Hyoscyamine, hyoscine butylbromide and hydrobromide, ipratropium, tropicamide, cyclopentolate, and pirenzepine. Muscarinic antagonists such as ipratropium bromide can also be effective in treating asthma, since acetylcholine is known to cause smooth muscle contraction, especially in the bronchi. Mebeverine Colofac, Duspatal, Duspatalin A muscolotropic spasmolytic with a strong and selective action on the smooth muscle spasm of the gastrointestinal tract, in particular of the colon. Irritable bowel syndrome in its primary form (e.g., Abdominal Pain, Bloating, Constipation, and Diarrhea). Irritable bowel syndrome associated with organic lesions of the gastrointestinal tract. (e.g., diverticulosis & diverticulitis, etc.). ↑ Mirakhur, RK (August 1991). "Preanaesthetic medication: a survey of current usage". Journal of the Royal Society of Medicine. 84 (8): 481–483. PMC 1293378 . PMID 1886116. 1 2 3 4 Table 10-5 in: Rod Flower; Humphrey P. Rang; Maureen M. Dale; Ritter, James M. (2007). Rang & Dale's pharmacology. Edinburgh: Churchill Livingstone. ISBN 0-443-06911-5.